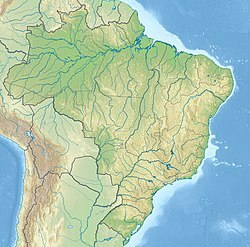 Location of Chapada dos Veadeiros National Park in Brazil. Chapada dos Veadeiros National Park (Portuguese: Parque Nacional da Chapada dos Veadeiros) is a national park of Brazil located in the Chapada dos Veadeiros, an ancient plateau with an estimated age of 1.8 billion years. Based in the Brazilian state of Goias, the park was created on January 11, 1961 by President Juscelino Kubitscheck, and listed as a World Heritage Site by Unesco in 2001. It occupies an area of 655 square kilometres (253 sq mi) in the municipalities of Alto Paraíso de Goiás, Cavalcante and Colinas do Sul. The park is maintained by Chico Mendes Institute for Biodiversity Conservation. The average yearly temperature is 24-26 degrees Celsius, ranging from a minimum of 4-8 degrees Celsius and reaching a maximum of 40-42 degrees Celsius. With altitudes between 600 and 1650 meters, it is the highest plain in Central Brazil. The highest point of the park and of the state of Goiás is Serra da Santana, at 1691 meters above sea level. Its rock formations are one of the oldest on the planet. There are quartz with outcrops of crystals. These rocks are exported and appreciated in Japan and England, where for some decades they were used for industrial work. Nowadays therapists and nature lovers seek energies and the power to cure from the crystals and from places like Alto Paraiso. Rock crystals are present in the soil of the rich cerrado, or open pasture. Forest growth is also still found in the region, where more than 25 species of orchids can be found, besides other Brazilian species such as pau d'arco roxo, copaíba (copa tree), aroeira (California pepper tree), tamanqueira (cork tree), terivá (a variety of palm tree), buritis (wine-palm) and Babaçu (Babassu). The main river in the park is the Rio Preto, a tributary of the Tocantins River. There are many waterfalls along its course such as the Rio Preto Falls (120 meters high, 80 meters at the base) and the Cariocas Falls. The park is noted for its scenic canyons, with walls of up to 40 metres (130 ft) high and valleys of up to 300 square metres (3,200 sq ft) deep. Rainbow adorns the Salto II waterfall of "Black River"
Chapada dos Veadeiros National Park is noted for its waterfalls. Those which range from 80 to 120 meters include the Corredeiras, Cannyon I, Cannyon II, the Carioquinhas Waterfall and the Jardim de Maitréya. In properties with controlled access: Águas Quentes, Morada do Sol, Banho das Crianças and Vale das Andorinhas, Salto do Raizama and Cannyon do Rio São Miguel, Vale da lua, Cachoeiras Almécegas I and Almécegas II, Cachoeira de São Bento, Cataratas do Rio dos Couros, Cachoeira do Rio Cristal, Cachoeira dos Anjos e dos Arcanjos, Água Fria, Cachoeira do Rio das Almas, Poço Encantado, Sertão Zen, Cachoeira do Rio Macaco, Território Kalunga, Lago Serra da Mesa, Bocaina do Faria, Cachoeira das Neves, Mirante do Pouso Alto, Alpes Goianos, Cachoeira do Santana, Cachoeira da Ave Maria, Morada do Sol, Pedra Escrita, Cachoeira das Pedras Bonitas, Cachoeira Santa Bárbara, Cachoeira Capivara, Cachoeira Candaru, Cachoeiras Barroco, Cachoeiras do Pratinha, Cachoeira Rei do Prata, Cachoeiras do Curriola, Cachoeira do São Bartolomeu, Cachoeiras Veredas, and Ponte de Pedra. The rich fauna of the region includes species, some of which are threatened by extinction, such as the pampas deer (locally known as veado campeiro), marsh deer (cervo do pantanal), maned wolves (lobo guará), jaguar, and others like the rhea (ema), seriema, tapeti, giant armadillo (tatu canastra), anteater (tamanduá), capybara (capivara), tapir (anta), green-beaked toucan (tucano de bico verde), black vulture (urubu), and the king vulture (urubu rei). Jump up ^ Pinto, Fernanda Iema. "Chapada dos Veadeiros" (in Portuguese). Folha Online. Retrieved 2007-02-19. ^ Jump up to: a b "Cerrado Protected Areas: Chapada dos Veadeiros and Emas National Parks". Paris, France: UNESCO. 2015. Retrieved 2015-07-04. Jump up ^ "Parque Nacional da Chapada dos Veadeiros" [Chapada dos Veadeiros National Park] (in Portuguese). Brasília, DF, Brazil: Instituto Chico Mendes de Conservação da Biodiversidade. 2015. Retrieved 2015-02-13. Jump up ^ "Chapada dos Veadeiros-Pico 1691, Brazil". Peakbagger.com. Wikimedia Commons has media related to Chapada dos Veadeiros National Park. Wikivoyage has a travel guide for Chapada dos Veadeiros National Park.